Hi Bruce, I am enjoying your image and also the story of how you captured it. To me it is always more enjoyable to hear the story that goes with taking the picture. I’m guessing the criticism you are thinking about is that you have taken the image from a higher angle that you’d like. Thanks for the compliments on the story behind the image. You are right, a higher angle than I would have liked. If I tried to go down to eye level by going down to the reed covered bank, I most likely would have chased all of them away from this bathing water source. Western Gull (is ID in meta-data) or California Gull (in title)? Neither? Glaucous? Hybrid? 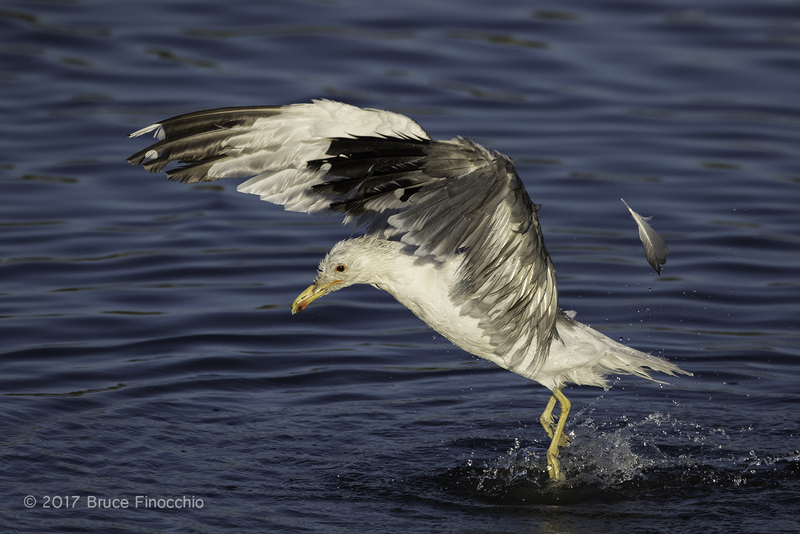 Western Gull has black/dark tail feathers. This image does not. Glaucous Gull is only gull, in lower 48, that has no dark colour or light colour on tail feathers. California Gull is only gull with red spot on bill AND a black spot on bill. California Gull has dark iris with red orbital ring. Next highest probability=California Gull/Glaucous Gull Hybrid. One would prefer a prominent feature to be located at a “Power Point”. This image does not follow any of the normal conventions for a prominent feature being located in a “Power Point”. Because of the pose, this image is appropriately cropped, the subject appears to be moving “into” the photo. I miss identified the gull as a western gull at first instead of the correct identification of a California Gull. Corrected it in my title, but I forgot to change the metadata. That’s why there was some confusion if you were looking at the title and the metadata.